There have been a variety of threads posted to forums and groups in recent months and years discussing the possibility that the vampire community may be declining, shifting, fluctuating, and/or contracting. 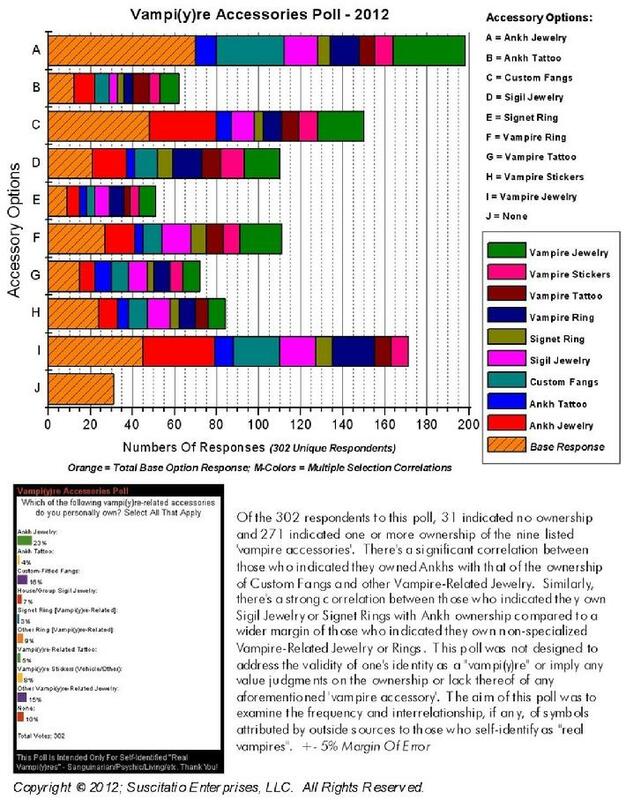 The following relates to online participation in the 'community'; not the numbers of individuals who identify as 'real vampires'. There have been noticeable overall activity declines in Community Forums, Yahoo Groups, MySpace Groups, Meetup Groups, NING Groups, LiveJournal Groups, etc. At the same time there have been noticeable overall activity increases with Twitter, Facebook, web chats, and other direct peer-to-peer networking. Granted there are exceptions to everything and not all social networking and information sites have seen declines in participation. - There is no decline; the community is just participating elsewhere. - The decline is temporary; community participation is cyclic. - Everyone is spread out to more sites and groups than before. - There are fewer established forums, groups, and web sites in existence today than five or ten years ago and this has left many displaced. - Leaders and elders have left the community and this has left a void in mentorship and resource sites. - Leaders and elders are disinterested or condescending towards newly awakened vampires. - The global economy is affecting participation. - The internet is evolving in a manner which is decreasing posts and articles while increasing real-time discussion. - The vampire community is an aging demographic and younger members are not coming along at the rates they once did. - Twilight, TrueBlood, and the recent media attention have driven vampires underground. - Twilight and TrueBlood fans will soon infiltrate our community and everyone is hiding. - There is a growing divide between those who view vampire as a condition and those who view it as metaphysical or spiritual. - The vampire community is growing faster offline than online. - Not enough resources are available to connect vampires offline and thus they are remaining solitary or leaving the community. - The increased quality of posts and discussions in the vampire community has discouraged would-be trolls and lurkers from participating. - The vampire community has reached a plateau of information or knowledge base and has lost considerable momentum. - The increase of publications and information available about real vampirism has created less of a need to participate or seek support from others. - Vampirism is evolving and/or blending with other communities. In 2007 we compiled data on activity levels of the major Yahoo Groups in order to chart participation trends in the vampire community. The Yahoo Groups represent the longest running and often most active sites for the vampire community dating back to 1998. Three years later we've now updated those charts and with few exceptions the declining trend remains the same. We've also compared posting-to-account levels on a variety of the remaining vampire community forums (we've lost many in recent years) and found anywhere from a 8% to 40% or greater decline in overall postings for vampirism and support specific topics (not off-topic/introductions/etc.). More interestingly, we've identified up to an average 20-25 post decrease in the number of posts per registered user account compared to levels in 2005 and 2006 for several forums. While there are greater numbers of users on these sites there are considerably less material contributions to the groups and forums. NING, Facebook, MySpace, LiveJournal, and Meetup also share similar declines and the recent move of some NING sites to Spruz and some Meetup Groups to Facebook Groups failed to match the posting levels and growth of the original. By and large Yahoo Groups, LiveJournal, Ning/Spruz, MySpace, and most forums are flat-lined or have seen significant declines in participation since the discussion of this topic in 2006, 07, 08, 08, 09, 10, etc... the "cyclic" trend many claim has remained in steady decline for the past six years. At the moment, Facebook participation in the vampire community accounts for the bulk of social networking interaction with active numbers (those discussing 'real' vampire-related topics with regularity) below 1,000 spread across nearly 70 groups/pages. We've contended (and still do) that social interaction within the vampire community (social groups in general; not just the vampire community/subculture) mirrors Rogers' diffusion of innovations theory and that given the increase of smartphone/mobile usage, state of the global economy and an aging demographic we're simply unplugging -- placing more value on offline or direct peer-to-peer interactions. How many total HOURS per YEAR on AVERAGE do you spend in the vampire community ACTIVELY engaged in VAMPIRE/VAMPIRISM-SPECIFIC tasks of posting discussions or replies, mentoring or providing direct assistance, attending social gatherings that aren't exclusively party/club oriented, meetings, conferences, writing articles/blogs/books, projects, or other hands-on tasks? Please do NOT include time spent leisure web surfing, reading, or other non-interactive/discussion/production tasks. This poll is designed primarily to address lay curiosity and by no means meant to be detailed or representative of a large sample. 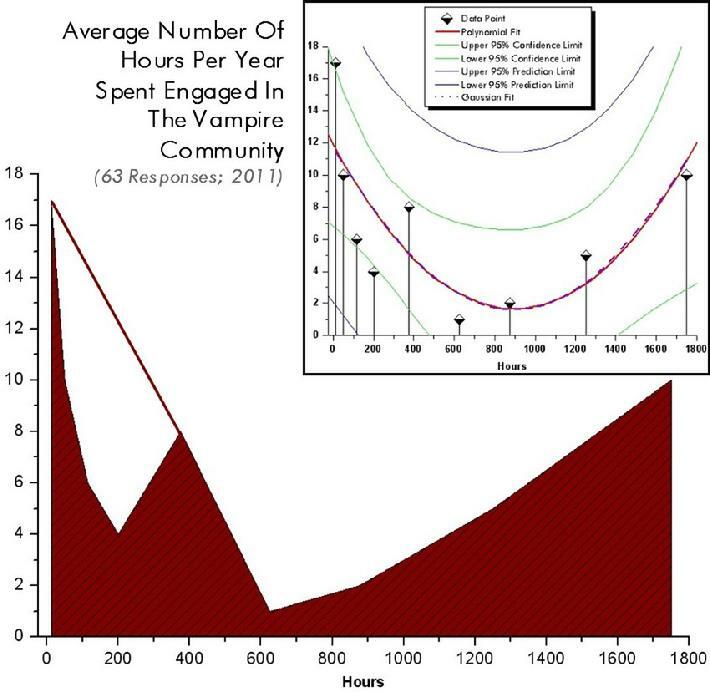 Ideally, all activities "vampire community related" one may engage in (online or offline) would be listed along with a standard measurement of time devoted to each on either a daily, monthly, and/or yearly average in order to most accurately illuminate the parameters of vampire community participation. The following is an aid to help conceptualize cumulative hours per year in terms of an average measurement per day. from Merticus & Suscitatio Enterprises, LLC.